US President Bush has finished his last trip on earth. The deceased president was taken to his final resting place in Whitehall, Texas. The train ride came after a week of ceremonies in Washington and Texas and was performed with a special train adorned in the colors of Air Force One and with the inscription 'George Bush 41' on the side. Bush will be buried near the 'College Station' stop at the presidential library of the A & M University of Texas, which was named after him. It was no secret that '41' liked trains: when the blue-gray 4141 locomotive, esspecially made for Bush, was unveiled in 2005, the former president joked that he probably would have taken the train more often than the Air Force One if the train had already existed during its presidency. The fact that that the train would transport Bush's body to its final resting place had been planned since 2009, says Bush's spokesperson Jim McGrath: "at the request of President Bush himself, we then contacted the railways and asked if a funeral train was possible." The locomotive was originally ordered for the opening of the exhibition 'Trains: Traces of the Iron Horse' in the library named after Bush in Whitehall. After a short training as a driver, Bush drove the train to the exhibition thirteen years ago. "We used to travel by train and I never forgot," Bush said on that occasion and remembered how often he took the train with his family as a child. The young Bush arrived by train at the army base where he would start his service as a fighter pilot in World War II, and after the war he drove back home by train. 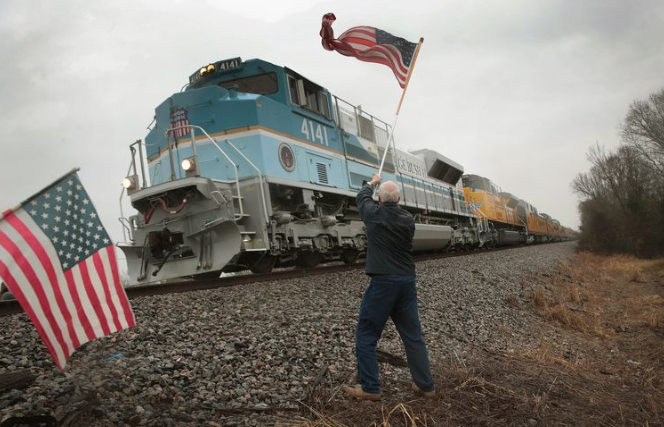 He also used the train for his campaign in 1988 and after his defeat to Bill Clinton in 1992, he joined the Midwest with the 'Spirit of America' train. That Bush was asking for a train for his funeral, is not so crazy, though it is already 49 years ago that the last time a president was taken by train to his final resting place. That was Dwight Eisenhower, who was taken by rail from Washington through seven states to his hometown Abilene in Kansas. Eisenhower was also the last US president to make frequent use of the train, as his wife Mamie thought flying was terrible. During the campaign of 1952, Eisenhower traveled by train for some 51,000 miles, stopping at 252 stations. In the villages that took the train on the 130-kilometer route during the ride from Houston to College Station in Whitemore, thousands of people stood along the tracks and on viaducts to deliver a final greeting to 'their' president. Bush lay in the sixth wagon, which was equipped with transparent windows for the occasion, so that the grieving crowd could catch a glimpse of the president's coffin, draped over with the American flag. In Pinehurst, one of the first villages to be visited by the train, 38-year-old Mr Andy Gordon had brought his two daughters of six and three. As he stood waiting to say a final greeting to the president he loved, he stated: "I hope my children will remember this moment and its meaning later." Bush will be buried next to his wife Barbara, who died in April of this year and his daughter Robin, who died at the age of three in 1953.